Two Pac polyurethane gloss painted doors and drawers. 50mm Titanium Polished Granite bench tops. Blum hardware with Tandem Box soft closing drawers complimented with orgaline storage systems. A feature of the frosted glass pantry doors is the automatic sensor upon entry. Polished Porcelain floor and wall tiles with a splash of Black as a highlight. Blum Aventos lift up bi folding doors. Bosch Appliances with a concealed under mount range hood. Designed with maximum storage in mind the Blum Aventos lift up doors allows easy access to the overhead cupboards and a Horizontal look creating an illusion of extra space. 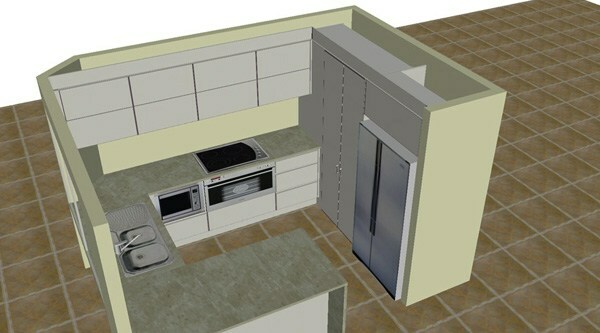 The step in corner pantry allows extra corner storage without protruding into the kitchen.